The Flag Ponds fisherman’s shanty is a reminder of days gone by, and of the thriving commercial fisheries that were a main component of the economies of our bayside towns. The shanties were in use from the early 1900s until the mid to late 1950s. It was a time before the Bay Bridge, when transportation by water was giving way to the new road system. Known as the Buoy Hotel, the shanty shows the close quarters and simple lifestyle of bay watermen. Built from wood and furnished with simple bunks and cast-off supplies, the shanties were not meant to be anything more than barebones accommodations for the fishermen. Many of the long-time fishermen had their own shanties. Bunking together over the summer months, the men plied the waters and tended and tarred their nets, away from their homes and families. The shanty housed up to six men at a time, many of whom lived full-time on the Eastern Shore. To harvest their fish more efficiently, the men entered into agreements with local landowners to store supplies closer to their fishing grounds. 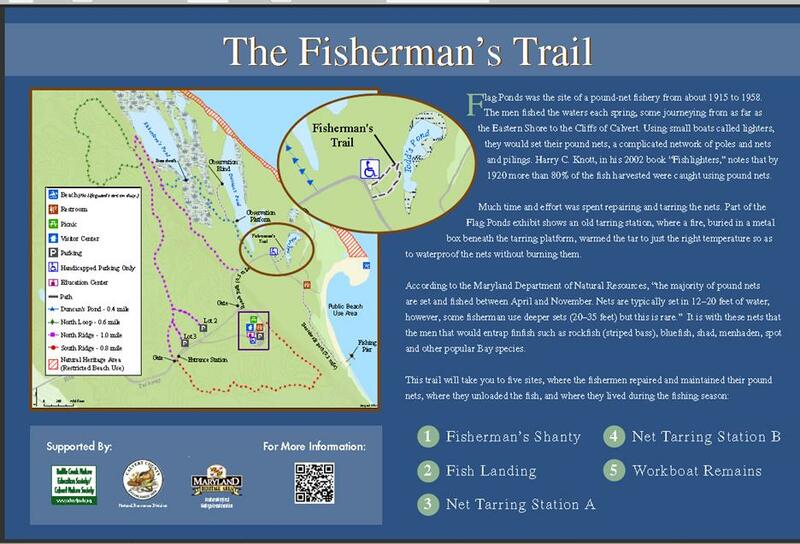 The commercial fisheries also needed support from drivers, cooks, and other local tradesmen. In addition to preparing their catch for market, much time and effort was spent repairing and tarring the nets. The old tarring station, where a fire, buried in a metal box beneath the tarring platform, warmed the tar to just the right temperature so as to waterproof the nets without burning them. As the commercial fisheries collapsed, many of the fishermen retired or moved on and the compound at Flag Ponds fell into disrepair. In October 2012, vandals set fire to the Fisherman's shanty at Flag Ponds.We will rebuild the site, but need your support to do so. 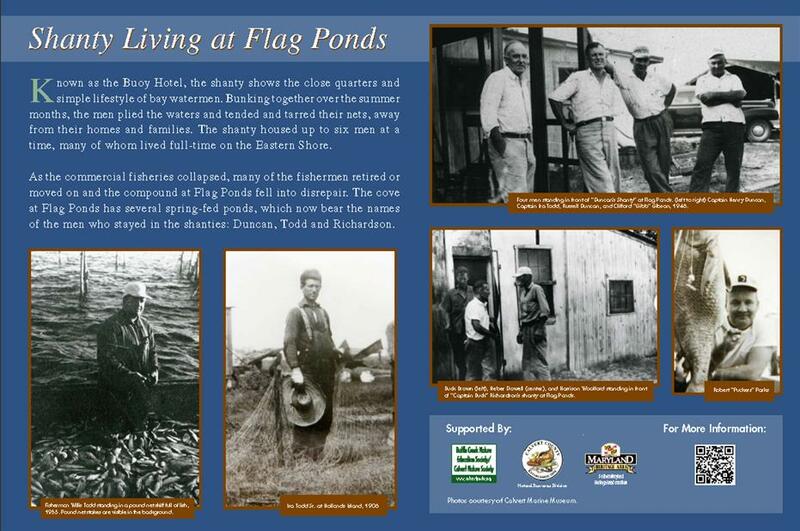 Flag Ponds was the site of a pound-net fishery from about 1915 to 1958.